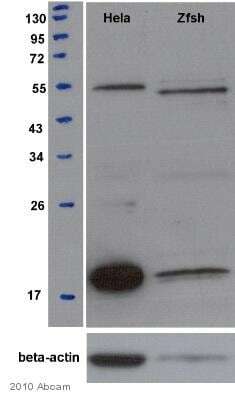 This antibody detects, by Western blot on human GFP fusion proteins in cell lysate, both HMGA1a and the splice variant HMGA1b, but does not detect HMGA2 (see review and Western blot picture). The antibody has not yet been successfully used to detect endogenous protein. Synthetic peptide conjugated to KLH derived from within residues 1 - 100 of Human HMGA1a/ HMGA1b. Our Abpromise guarantee covers the use of ab4078 in the following tested applications. WB 1/1000. Detects a band of approximately 11 kDa (predicted molecular weight: 11.5 kDa). See Abreview submitted on 15 December 2009. Although this antibody gives a specific signal in Immunofluoresence, we have had suggestions that strong background signals are seen. See review by Robert Hock and IF picture below. Lane 1 : Whole cell lysate from HepG2 cells transfected with plasmids coding for hHMGA1a GFP fusion proteins. Whole cell lysate from HepG2 cells transfected with plasmids coding for hHMGA1a-, hHMGA1b-, hHMGA2- or NLS- (nuclear localisation signal) GFP fusion proteins. ab4078 was diluted 1/1000 in 5% milk/TBS and incubated for 1 hr at room temperature. Secondary HRP anti-rabbit antibody was diluted 1/10000 in 5% milk/TBS and incubated for 1 hr at room temperature. The detected size is that expected for the fusion of an 11kD and 26kD protein (GFP). Immunofluoresence on MCF-7 cells transfected with human HMGA1a-GFP using ab4078. Chromatin was prepared from the Human Embryonic Stem Cells. The cross-linking (X-ChiP) technique was used; crosslinking was performed for 15 minutes in formaldehyde. The primary antibody was diluted 1/100 in IP dilution buffer and incubated with the sample for 12 hours at 4°C. 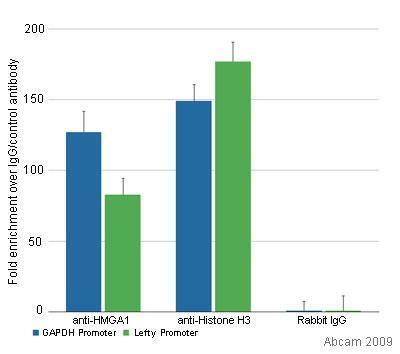 Histone H3 was used as the positive control, whilst normal rabbit IgG was used as the negative control. The immunoprecipitated DNA was quantified by real time PCR. IHC image of ab4078 staining in human placenta formalin fixed paraffin embedded tissue section, performed on a Leica BondTM system using the standard protocol F. The section was pre-treated using heat mediated antigen retrieval with sodium citrate buffer (pH6, epitope retrieval solution 1) for 20 mins. The section was then incubated with ab4078, 1µg/ml, for 15 mins at room temperature and detected using an HRP conjugated compact polymer system. DAB was used as the chromogen. The section was then counterstained with haematoxylin and mounted with DPX. Publishing research using ab4078? Please let us know so that we can cite the reference in this datasheet. The most recent vial of ab4078, rabbit polyclonal to HMGA1a / HMGA1b (order 911447) failed in ChIP twice. Previous vials from othere lots have worked well with the same protocol and samples. I am sorry this product did not perform as stated on the datasheet and for the inconvenience this has caused. As requested, I have issued a free of charge replacement (from a different lot) with the order number 949551. To check the status of the order please contact our Customer Service team and reference this number. Please note that this free of charge replacement vial is also covered by our Abpromise guarantee. Should you still be experiencing difficulties, or if you have any further questions, please do not hesitate to let us know. I wish you the best of luck with your research.